December 5th, 2015 in Arlington, Virginia, the Rwandan Diaspora Community in the U.S. Leadership Retreat was held. The embassy of the Republic of Rwanda, community leaders on the national level and local leadership representatives, and advisors met to discuss how to strengthen the Rwandan U.S. diaspora operations. The cooperation between the embassy and the Rwandan diaspora and their collective zeal to engage with their counterparts in Rwanda has been instrumental in the sustainability of the diaspora community. A little less than two years ago, a national committee was elected in order to better organize the Rwandan community and stay connected. Since the institution of the U.S. Rwandan Diaspora (USRD), there have been several successful events that showcased the importance of work in a structured community. A few examples include Rwandan Day, the Rwandan Youth Forum, and the Rwandan Christian Convention. The retreat was opened by Mr. Manzi Lawrence, First Counselor, and Charge d`affaires, who called upon diaspora leaders to work with community members in finding solutions to the issues of its diaspora. He emphasized the importance of creating ownership and engaged citizenry in the Rwandan community. He urged those present to tap into the skills of the community to address relevant needs. Her Excellency the ambassador Mathilde Mukantabana who was unable to attend the retreat shared her message to the community leaders via a pre-recorded video. She provided her guidance and expressed her expectations after the retreat. She urged those present at the retreat to aim for actionable and practical resolutions. She commended the existing structures and called for better coordination throughout the U.S. diaspora. She assured those present of her solidarity in seeing the set goals coming to fruition. In his address to those who were present, Brig. Gen. Innocent Kabandana, the Defense Attach at the Rwandan embassy in Washington, DC said being an asset to your country requires that one attends to their obligations. Doing this involves bringing added value in knowledge, character, and humanity. He urged Rwandans, wherever they are in the U.S., to be a true representation of what Rwanda is today, and to embody Rwanda’s vision. He called those present to harness knowledge obtained in the U.S. to enhance Rwanda’s overall development. Dr. Clet Niyikiza urged those present to do the little they can do to promote the interests of Rwanda. He emphasized that this cannot happen without a personal capacity building. 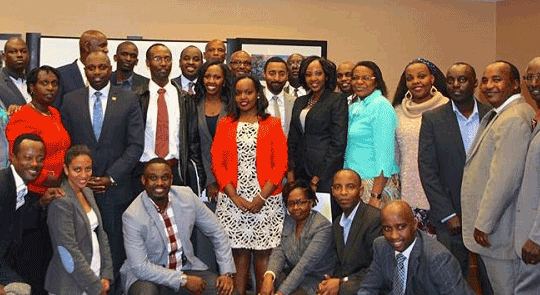 Those present agreed that Rwandans in the U.S. can use their rights to engage U.S. government representatives and influence the decisions made on issues regarding Rwanda. Like the Brig. Gen. Kabandana said U Rwanda ntabwo ruziritse mu mipaka y’u Rwanda, ruziritse mu mitima y’Abanyarwanda. Aho Umunyarwanda ari niho turubona. The contribution of each and every one is key to the development of the Rwandan society. In order to sustain the existing communities and be able to stay functional, funding was extensively discussed and mechanisms to remain self-sustained on the local level and national level was proposed. The topic of investment was also discussed. Mr. Nganji commented on the necessity of promoting Rwanda as a hub of profitable businesses in our networks and to remain informed in the area of investment. He called for participants to get involved in local associations and financial institutions in order to build linkages that bring investment to our country. “Utilizing our own skills and seeking partnerships with other entities is key to putting Rwanda on the global investment map,” he said. In order to maintain the Rwandan community in the U.S. connected, Mr. Frank Kayijuka, First Counselor at the Rwandan Embassy, highlighted the importance of adequate communication between national/local committees and the embassy. Mr. Gaetan Gatete, the Chairman of USRD stressed the importance of cooperation between all leadership entities and the embassy. He urged those present to share their experiences and create a complementary set of knowledge that would enable all of our communities to build a stronger Rwandan Diaspora. This successful retreat was a first of its kind in the U.S. Rwandan community, and the participants expressed their wish for this to be a yearly program that will bring together leaders from across the country to discuss how to strengthen the community in the U.S, but more importantly, how to be active participatory members of the Rwandan society by supporting Rwanda`s development from afar. Solidarity is key in the advancement of any country, and those who were present ended the retreat with a set of actionable and practical recommendations aiming to further improve the operations of the Rwandan diaspora in the U.S.